Branding your account is one of the most important steps you'll take in the entire account setup process. Why? Because to the subscriber, it should always appear that emails are coming from you, not Listrak. In terms of the end user, Listrak acts as your invisible partner. The branding process consists of creating six DNS records on your DNS host server. The records can be created on your primary domain name, a new/secondary domain name, or a domain name belonging to one of your clients. We recommend that you use the same domain for all six DNS records. TIP: Because a working knowledge of the DNS hierarchical naming system is required, we recommend that you consider involving a member of your organization’s IT team in the creation of the DNS records. Deliverability: Recipient domains may reject mail whose source is uncertain. Trust: Readers are more likely to engage with content that clearly comes from the company to which they subscribed. Link URLs: When recipients hover over the links in your email and see the URLs behind them, they will see your domain name instead of Listrak’s domain name. Blocked Emails: ISPs (Internet Service Providers) receive many email abuse complaints each day. And often, the primary criteria ISPs use to block messages are the URLs within each message. When configuring a domain alias, be sure to configure your website HSTS settings to support branded subdomains. NOTE: Never add this record to your root domain. Doing so could cause your incoming mail to be undeliverable, or worse, unrecoverable. Now that the branding settings have been configured on your DNS host, they must be registered within the Listrak application. Follow the below steps to add the settings to your Listrak account. In the Listrak application, navigate from the home menu to Manage. In the top right-hand corner, enter the Domain Alias, Media Domain, and Bounce Domain in the applicable text fields. These settings will now be available for selection from within the list settings section for each list. bounce.example.com. IN TXT "v=spf1 include:esp1.co -all"
DomainKeys Identified Mail (DKIM) allows you to take responsibility for a message in transit. You become the handler of the message as its originator. Your organization’s reputation becomes the basis for evaluating whether or not to trust the message and whether or not to deliver it. DKIM is created based on the from address domain. What is the from domain that you will be using to send mail? Complaint feedback loops (FBL) allow for automatic removal of contacts if the message is marked as spam. Providers that offer feedback are set up automatically. The Yahoo Feedback Loop is a domain-based feedback system. Listrak can receive Yahoo spam complaints if the sender's domain is set up to forward that information to Listrak. To enable this feature for Yahoo mail users, you must verify ownership of your sending domain via a confirmation email that is sent to postmaster@yourdomain.com mailbox. This can also be set up as a forwarder that can deliver the confirmation message to an existing mailbox. Without FBL, emails will be delivered to a spam folder, which will reduce open rates, can cause delays in delivery, and impact inbox placement overall. Yahoo has created a sign-up process that should be done synchronously with the postmaster@example.com address upon the applicant’s request. Because of this, we ask that clients forward their postmaster@example.com address to postmaster@abuse.listrak.com as requested above. If you or your team does not feel comfortable with this approach, don't fret. Simply call our support team at support@listrak.com to walk through the application process over the phone with one of our experts. Gmail offers additional Postmaster Tools to bulk email senders. The majority of Listrak clients are bulk mailers and qualify for this program. By allowing Listrak to utilize the Gmail Postmaster Tools on your behalf, we can better serve you if there are any deliverability issues. To grant access, simply contact Listrak Technical Support at support@listrak.com. Based on your from address domain, Listrak Technical Support will give you up to two additional CNAME records to add to your DNS. These entries are for Gmail to verify ownership of the domain and to grant access to Listrak’s team to further help with any deliverability issues that may arise. NOTE: Access to this information can be revoked by you at any time by, removing the CNAME records that we have requested to add. 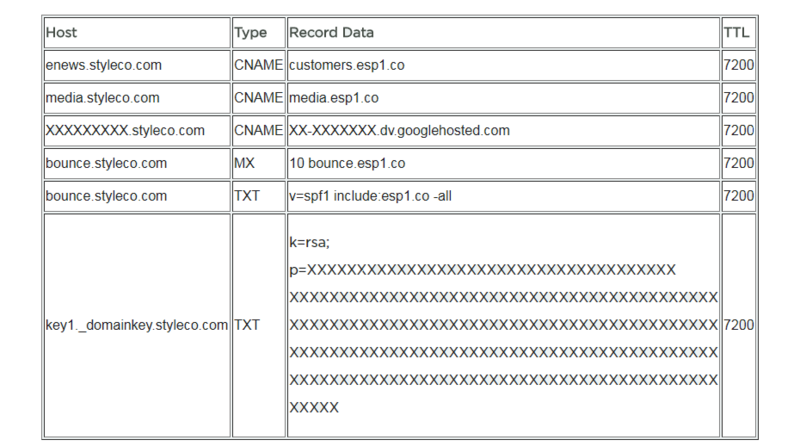 NOTE: Depending upon your DNS, you may or may not choose to include your domain in the record itself. Some DNS servers require the addition of an asterisk* or an at sign@ in place of your domain. When using a Microsoft DNS server, Microsoft encapsulates all TXT records in quotes automatically. You can omit them when pasting the data. UNIX/LINUX DNS servers generally will encapsulate TXT records in quotes, so you will need to include them. If you are using a control panel to edit DNS, you will most likely need to use quotes but it would be best to verify this with your DNS Provider. Below is a list of guides that are tailored to specific DNS providers.